Dr. Aplenc's primary focus is on the treatment of pediatric acute myelogenous leukemia (AML). One of Dr. Aplenc's first patients had acute myeloid leukemia (AML). His experience caring for her changed the path of his career. Dr. Richard Aplenc is an Associate Professor of Pediatrics in the Department of Pediatrics and a core faculty member of the Center for Pediatric Clinical Effectiveness at CHOP. Dr. Aplenc’s research focuses on improving the outcomes of children with cancer, particularly acute myeloid leukemia (AML.) His work involves the treatment of AML in children and the use of genetic data to predict treatment response to therapeutic interventions. Dr. Aplenc has NIH funded research efforts in pediatric AML focused on determining the genetic predictors of treatment response (specifically relapse and infection risk) and using administrative/billing data to augment NCI funded cooperative oncology group clinical trials. He is currently leading a genome-wide genotyping effort to discover genetic variations that change the risks of relapse, life-threatening infections, and heart complications in children treated for AML. He also leads several efforts to use administrative data sets to improve the care of children with AML, particularly focusing on antibiotic and intensive care use. Dr. Aplenc leads a large, Phase III trial for children with acute myeloid leukemia in the Children’s Oncology Group and serves as the Vice-Chair of the COG AML Committee. In addition to this work, Dr. Aplenc also leads Phase I trials for children whose cancers have not responded to standard therapy. These trials include gemtuzumab, dasatinib and obatoclax. 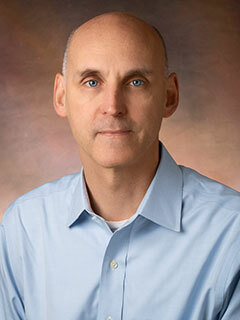 He is the Primary Investigator at Children’s Hospital of Philadelphia for multiple Phase I trials that are offered through the Children’s Oncology Group and he helps lead the Hematologic Malignancies Program and Experimental Therapeutics Program here at CHOP. The Children's Hospital of Philadelphia has a long tradition of embracing the total care of patients and their families. Every child receiving complex cancer therapy needs the expertise of more than one provider. That is why Dr. Aplenc works with other CHOP physicians, nurses and social workers to provide a team approach to total care. This kind of collaboration with the family and patient helps provide the best, most modern and sophisticated care — not only nationally, but in the world. University of California, San Diego. Calif.
Vujkovic M, Attiyeh EF, Ries RE, Goodman EK, Ding Y, Kavcic M, Alonzo TA, Wang YC, Gerbing RB, Sung L, Hirsch B, Raimondi S, Gamis AS, Meshinchi S, Aplenc R. Genomic architecture and treatment outcome in pediatric acute myeloid leukemia: a Children’s Oncology Group report. Blood. 2017;129(23):3051-3058. Getz KD, Li Y, Alonzo TA, Hall M, Gerbing RB, Sung L, Huang YS, Arnold S, Seif AE, Miller TP, Bagatell R, Fisher BT, Adamson PC, Gamis A, Keren R, Aplenc R. Comparison of in-patient costs for children treated on the AAML0531 clinical trial: A report from the Children's Oncology Group. Pediatr Blood Cancer. 2015 Oct;62(10):1775-81. Read the abstract. Getz KD, Miller TP, Seif AE, Li Y, Huang YS, Bagatell R, Fisher BT, Aplenc R. A comparison of resource utilization following chemotherapy for acute myeloid leukemia in children discharged versus children that remain hospitalized during neutropenia. Cancer Med. 2015 Sep;4(9):1356-64. Read the abstract. Miller TP, Troxel AB, Li Y, Huang YS, Alonzo TA, Gerbing RB, Hall M, Torp K, Fisher BT, Bagatell R, Seif AE, Sung L, Gamis A, Rubin D, Luger S, Aplenc R. Comparison of administrative/billing data to expected protocol-mandated chemotherapy exposure in children with acute myeloid leukemia: A report from the Children's Oncology Group. Pediatr Blood Cancer. 2015 Jul;62(7):1184-9. Read the abstract. G Salazar E, Bernhardt MB, Li Y, Aplenc R, Adamson PC. The impact of chemotherapy shortages on COG and local clinical trials: a report from the Children's Oncology Group. Pediatr Blood Cancer. 2015 Jun;62(6):940-4. Read the abstract. Seif AE, Walker DM, Li Y, Huang YS, Kavcic M, Torp K, Bagatell R, Fisher BT, Aplenc R. Dexrazoxane exposure and risk of secondary acute myeloid leukemia in pediatric oncology patients. Pediatr Blood Cancer. 2015 Apr;62(4):704-9. Read the abstract. Cantu E, Shah RJ, Lin W, Daye ZJ, Diamond JM, Suzuki Y, Ellis JH, Borders CF, Andah GA, Beduhn B, Meyer NJ, Ruschefski M, Aplenc R, Feng R, Christie JD; Lung Transplant Outcomes Group Investigators. Oxidant stress regulatory genetic variation in recipients and donors contributes to risk of primary graft dysfunction after lung transplantation. J Thorac Cardiovasc Surg. 2015 Feb;149(2):596-602. Read the abstract. Wray L, Vujkovic M, McWilliams T, Cannon S, Devidas M, Stork L, Aplenc R. TPMT and MTHFR genotype is not associated with altered risk of thioguanine-related sinusoidal obstruction syndrome in pediatric acute lymphoblastic leukemia: a report from the Children's Oncology Group. Pediatr Blood Cancer. 2014 Nov;61(11):2086-8. Read the abstract. Freedman JL, Faerber J, Kang TI, Dai D, Fisher BT, Huang YS, Li Y, Aplenc R, Feudtner C. Predictors of antiemetic alteration in pediatric acute myeloid leukemia. Pediatr Blood Cancer. 2014 Oct;61(10):1798-805. Read the abstract. Goodman EK, Reilly AF, Fisher BT, Fitzgerald J, Li Y, Seif AE, Huang YS, Bagatell R, Aplenc R. Association of weekend admission with hospital length of stay, time to chemotherapy, and risk for respiratory failure in pediatric patients with newly diagnosed leukemia at freestanding US children's hospitals. JAMA Pediatr. 2014 Oct;168(10):925-31. Read the abstract. Maude SL, Frey N, Shaw PA, Aplenc R, Barrett DM, Bunin NJ, Chew A, Gonzalez VE, Zheng Z, Lacey SF, Mahnke YD, Melenhorst JJ, Rheingold SR, Shen A, Teachey DT, Levine BL, June CH, Porter DL, Grupp SA. Chimeric antigen receptor T cells for sustained remissions in leukemia. N Engl J Med. 2014 Oct 16;371(16):1507-17. Read the abstract. Gamis AS, Alonzo TA, Meshinchi S, Sung L, Gerbing RB, Raimondi SC, Hirsch BA, Kahwash SB, Heerema-McKenney A, Winter L, Glick K, Davies SM, Byron P, Smith FO, Aplenc R. Gemtuzumab ozogamicin in children and adolescents with de novo acute myeloid leukemia improves event-free survival by reducing relapse risk: results from the randomized phase III Children’s Oncology Group trial AAML0531. J Clin Oncol. 2014 Sep 20;32(27):3021-32. Read the article. Desai AV, Kavcic M, Huang YS, Herbst N, Fisher BT, Seif AE, Li Y, Hennessy S, Aplenc R, Bagatell R. Establishing a high-risk neuroblastoma cohort using the Pediatric Health Information System Database. Pediatr Blood Cancer. 2014 Jun;61(6):1129-31. Read the abstract. Aplenc R, Zhang MJ, Sung L, Zhu X, Ho VT, Cooke K, Dvorak C, Hale G, Isola LM, Lazarus HM, McCarthy PL, Olsson R, Pulsipher M, Pasquini MC, Bunin N; Regimen-Related Toxicity Working Committee, Center for International Blood and Marrow Transplant Research. Effect of body mass in children with hematologic malignancies undergoing allogeneic bone marrow transplantation. Blood. 2014 May 29;123(22):3504-11. Read the abstract. Seif AE, Fisher BT, Li Y, Torp K, Rheam DP, Huang YS, Harris T, Shah A, Hall M, Fieldston ES, Kavcic M, Vujkovic M, Bailey LC, Kersun LS, Reilly AF, Rheingold SR, Walker DM, Aplenc R. Patient and hospital factors associated with induction mortality in acute lymphoblastic leukemia. Pediatr Blood Cancer. 2014 May;61(5):846-52. Read the abstract. Oshrine BR, Olsen MN, Heneghan M, Wertheim G, Daber R, Wilmoth DM, Biegel JA, Pawel B, Aplenc R, King RL. Acquired isochromosome 12p, somatic TP53 and PTEN mutations, and a germline ATM variant in an adolescent male with concurrent acute megakaryoblastic leukemia and mediastinal germ cell tumor. Cancer Genet. 2014 Apr;207(4):153-9. Read the abstract. Fisher BT, Kavcic M, Li Y, Seif AE, Bagatell R, Huang YS, Zaoutis T, Torp K, Leckerman KH, Aplenc R. Antifungal prophylaxis associated with decreased induction mortality rates and resources utilized in children with new-onset acute myeloid leukemia. Clin Infect Dis. 2014 Feb;58(4):502-8. Read the abstract. Maude SL, Fitzgerald JC, Fisher BT, Li Y, Huang YS, Torp K, Seif AE, Kavcic M, Walker DM, Leckerman KH, Kilbaugh TJ, Rheingold SR, Sung L, Zaoutis TE, Berg RA, Nadkarni VM, Thomas NJ, Aplenc R. Outcome of pediatric acute myeloid leukemia patients receiving intensive care in the United States. Pediatr Crit Care Med. 2014 Feb;15(2):112-20. Read the abstract. Fisher BT, Singh S, Huang YS, Li Y, Gregory J, Walker D, Seif AE, Kavcic M, Aplenc R. Induction mortality, ATRA administration, and resource utilization in a nationally representative cohort of children with acute promyelocytic leukemia in the United States from 1999 to 2009. Pediatr Blood Cancer. 2014 Jan;61(1):68-73. Read the abstract. Lothstein K, Fisher B, Li Y, Seif A, Harris T, Torp K, Kavcic M, Huang YS, Rheingold SR, Aplenc R. Zoonotic infections in pediatric patients with acute leukemia. Pediatr Blood Cancer. 2013 Dec;60(12):E160-2. Read the abstract. de Blank P, Zaoutis T, Fisher B, Troxel A, Kim J, Aplenc R. Trends in Clostridium difficile infection and risk factors for hospital acquisition of Clostridium difficile among children with cancer. J Pediatr. 2013 Sep;163(3):699-705. Read the abstract. Johnston DL, Nagarajan R, Caparas M, Schulte F, Cullen P, Aplenc R, Sung L. Reasons for non-completion of health related quality of life evaluations in pediatric acute myeloid leukemia: a report from the Children's Oncology Group. PLoS One. 2013 Sep 6;8(9):e74549. Read the abstract. Fisher BT, Gerber JS, Leckerman KH, Seif AE, Huang YS, Li Y, Harris T, Torp K, Douglas R, Shah A, Walker D, Aplenc R. Variation in hospital antibiotic prescribing practices for children with acute lymphoblastic leukemia. Leuk Lymphoma. 2013 Aug;54(8):1633-9. Read the abstract. Kavcic M, Fisher BT, Seif AE, Li Y, Huang YS, Walker D, Aplenc R. Leveraging administrative data to monitor rituximab use in 2875 patients at 42 freestanding children's hospitals across the United States. J Pediatr. 2013 Jun;162(6):1252-8, 1258.e1. Read the abstract. Kavcic M, Fisher BT, Li Y, Seif AE, Torp K, Walker DM, Huang YS, Lee GE, Tasian SK, Vujkovic M, Bagatell R, Aplenc R. Induction mortality and resource utilization in children treated for acute myeloid leukemia at free-standing pediatric hospitals in the United States. Cancer. 2013 May 15;119(10):1916-23. Read the abstract. Puumala SE, Ross JA, Aplenc R, Spector LG. Epidemiology of childhood acute myeloid leukemia. Pediatr Blood Cancer. 2013 May;60(5):728-33. Read the abstract. Grupp SA, Kalos M, Barrett D, Aplenc R, Porter DL, Rheingold SR, Teachey DT, Chew A, Hauck B, Wright JF, Milone MC, Levine BL, June CH. Chimeric antigen receptor-modified T cells for acute lymphoid leukemia. N Engl J Med. 2013 Apr 18;368(16):1509-18. Read the abstract. Walker DM, Fisher BT, Seif AE, Huang YS, Torp K, Li Y, Aplenc R. Dexrazoxane use in pediatric patients with acute lymphoblastic or myeloid leukemia from 1999 and 2009: analysis of a national cohort of patients in the Pediatric Health Information Systems database. Pediatr Blood Cancer. 2013 Apr;60(4):616-20. Read the abstract. Kavcic M, Fisher BT, Torp K, Li Y, Huang YS, Seif AE, Vujkovic M, Aplenc R. Assembly of a cohort of children treated for acute myeloid leukemia at free-standing children's hospitals in the United States using an administrative database. Pediatr Blood Cancer. 2013 Mar;60(3):508-11. Read the abstract. Kang TI, Hexem K, Localio R, Aplenc R, Feudtner C. The use of palliative chemotherapy in pediatric oncology patients: a national survey of pediatric oncologists. Pediatr Blood Cancer. 2013 Jan;60(1):88-94. Read the abstract.